Depending on how old you are, there was a time when Laurel and Hardy shorts were played with Saturday morning cartoons. Born from the vaudeville days, their humor was broad and slapstick. Laurel being the doofy one and Hardy thinking he's the brains. This biographical film is based on the later years of their career directed by Jon S. Baird and written by Jeff Pope. As with all aging entertainers, they rely on their past hits and skits. It's their endearing friendship that bonds the two men giving this story a sensitive and heart felt journey. In 1937 it was their height of the comedy duo's popularity. Stan (Steve Coogan) wants to confront the studio producer Hal Roach (Danny Houston) that they need more financial recognition for their global fame or they will not renew their contract. Ollie (John C. Reilly) doesn't want to rock the boat as he's broke from paying alimony to his various ex-wives and a serious gambling habit. 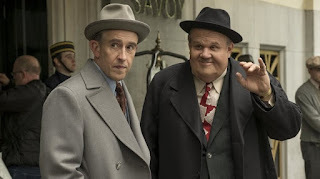 The rift separates the two until they are reunited in 1953 for a comedy tour in the U.K Stan convinced Ollie that at the end of their tour they will do movie based on Robin Hood that Stan is rewriting. Stan is the writer of all their bits and Ollie laughs as his biggest fan having worked together since 1927. Now in their 60's they are embarking on a comeback tour. Their English tour manager/producer Bernard (Rufus Jones) has booked them in seedy hotels and low class music halls all the while encouraging them that it's going to be best. Hardly anyone shows up and they are discouraged as their wives are meeting them when they eventually hit London. They decide to do public relation advertising and soon they playing to packed theaters. Stan learns that the studio producer has decided they can not get the financing for their Robin Hood project. He is unable to tell Ollie the news and they continue to rehearse the scenes that Stan has written. The arrival of their wives Lucille (Shirley Henderson), the third Mrs. Hardy, and Ida (Nina Arianda), the fourth Mrs. Laurel are also used as a bit much to the women's annoyance. Lucille wants Ollie to retire. His weight and poor health is a constant worry. The tension between the duo comes to a head at a reception after their big performance, then Ollie suffers a heart attack while judging a beauty pageant at a seaside resort. The reality that their run has finally come to an end gives the two a time to reflect. Bernard tries to hire a replacement for Ollie, a local comedy star Nobby Cook (John Henshaw). Stan realizes it's not the same and goes back to make peace with his friend. The film is somewhat typical of biopics as far as they go. The story is focused on the ebbing years of their career as they look back without regret. It's the performances by Reilly and Coogan that give the story some heart. Laurel and Hardy used their odd couple chemistry as a source of humor. When the two were in public they slipped into their personas. They were hard working professionals no matter what size the audience or what personal grievances they had with each other. They appeared in 107 films, starring in 32 short silent films, 40 short sound films, and 23 full-length feature films. It's sad to think that their legacy will be lost to future generations.